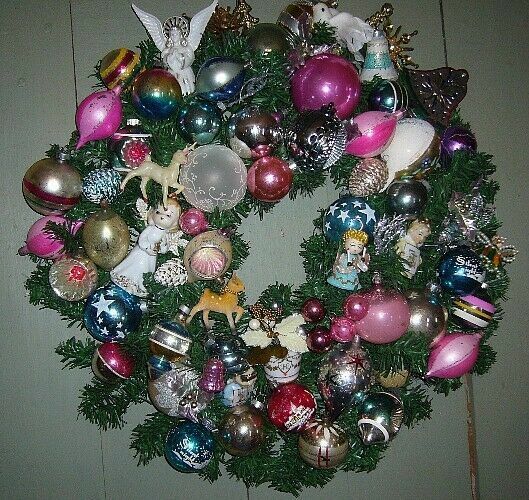 Fabulous Retro Christmas Ornament Wreath with lots of Angels and Balls! A Fabulous One of a Kind Retro Vintage Christmas Ornament Wreath with Lots of Angels and Vintage Balls. YOU CAN BRING BACK MANY CHILDHOOD MEMORIES LOOKING AT ALL THE ORNAMENTS OF THIS WREATH AND MAKE IT A FAMILY HEIRLOOM TO BE PASSED ON FOR YEARS TO COME. A BREATHTAKING ONE OF A KIND WREATH FULL OF VINTAGE ORNAMENTS. THE WREATH IS 20 INCHES IN DIAMETER. MANY OF THE FIGURAL ITEMS ARE MARKED, JAPAN. I HAVE BEEN COLLECTING AND SAVING THESE TREASURES TO MAKE THESE WREATHS FOR MY FRIENDS AND FAMILY AND DECIDED TO MAKE SOME TO SHARE WITH YOU. DUE TO THE VERY DELICATE NATURE OF THESE WREATHS THEY HAVE TO BE CAREFULLY PACKAGED IN SPECIAL BOXES.